Personal safety is important. We can pretty much all agree on that. If you feel endangered or are injured, quality of life takes a pretty steep dive. Personal safety in the workplace is the responsibility of both workers and companies, and most companies make it a priority to ensure that their employees remain injury free. One way they do so is by investing in the proper material handling equipment to accomplish the job. Proper equipment both ensures safety and increases productivity. For example, conveyors and sortation systems help move product around to avoid employee strain and expedite material handling processes. Whether it’s a gravity conveyor to help avoid lift strain or high-speed sorters to give higher throughput, proper equipment (and the safe use thereof) can make material handling safer and easier. However, equipment is only as safe as it’s users. Making sure that employees are knowledgeable about the equipment in their workplace and taught to safely utilize it is key to success as well. 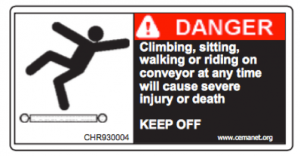 While many companies have their own safety programs based on OSHA standards, material handling products that CSS member companies manufacture have instructions specific to each piece of equipment that need to be utilized. These instructions are written as a result of rigorous testing and are a key component of employee education for safe material handling using the product. As a part of their ongoing mission to support the end users who buy their products, CSS members have reached out to ask users about how they can support safe use of their equipment. Most respondents stated that they have educational gaps as it relates to safety regarding material handling equipment, and CSS is creating educational content, like this blog series, to help fill those gaps. Manufacturers create materials such as labels and manuals to also help fill those gaps. 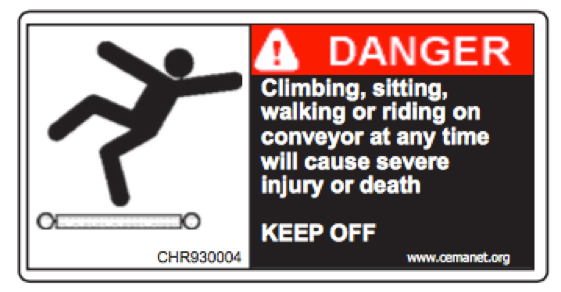 Equipment should include safety labels specific to each hazard. Most companies use standardized labels from the Conveyor Equipment Manufacturers Association (CEMA, www.cemanet.org). This organization focuses on safety in the conveyor industry to provide best practices and standards for all to use. It is critical that employees that work with this equipment familiarize themselves with these labels and hazards. Additionally, manuals for installation, maintenance, and instruction are included from the manufacturer to educate employees on the products they will be using. As use of technology continues to increase (and a visual generation enters the workforce), instructional videos are provided or linked in the literature to help workers understand how to utilize these products. As we get into the rhythm of daily work and become more familiar with the equipment, we can start to overlook these resources, but these materials hold mission-critical information that promotes proper (and effective) use and safety. If you have questions about your equipment, you can contact your OEM and they will be happy to provide you with more information. Often manufacturers will also offer “schools” or seminars that you can enroll in to learn more about their equipment. Personal safety in the workplace is often directly linked to happiness and job satisfaction. A quick Google search shows reputable sources backing this up, and we’re on board. We want employees to be safe and satisfied, so MHI and the CSS members are here to assist in providing you information to keep your employees using material handling safely. As CSS develops new content, we welcome feedback on specific educational needs for your business. You can visit mhi.org/css to learn more today.